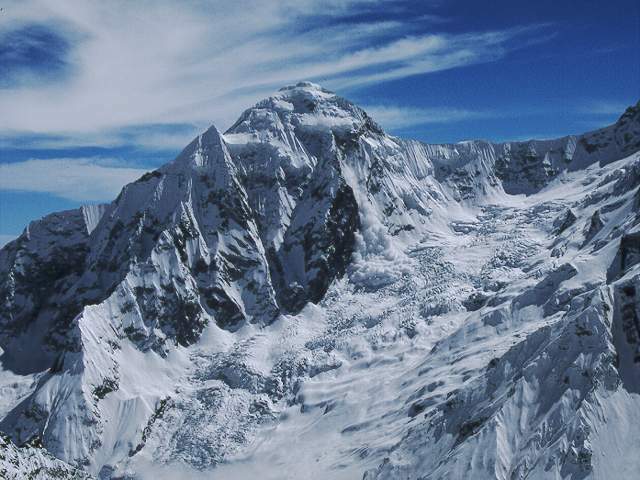 In March and April 1997 I was on a small climbing expedition to Nepal with Don McIntyre (team leader), Rod Richardson, and Todd Anderson; veterans of many big peaks, dwarfing my meager experience. Arriving in the Annapurna Sanctuary full of enthusiasm our ultimate goal was an ambitious one: Annapurna South (7219m/23693ft). 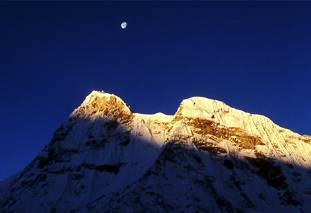 We first were to acclimate on Tharpu Chuli (5500m/18045ft), set up a camp in the vicinity of its Northwest ridge, attempt Singu Chuli (6501m/21328ft), then return to base camp to prepare for Annapurna South. Our route up the mountain was to be from the Northeast where we were to gain the East-West ridge between Hiunchuli and Annapurna South and follow that to the summit. 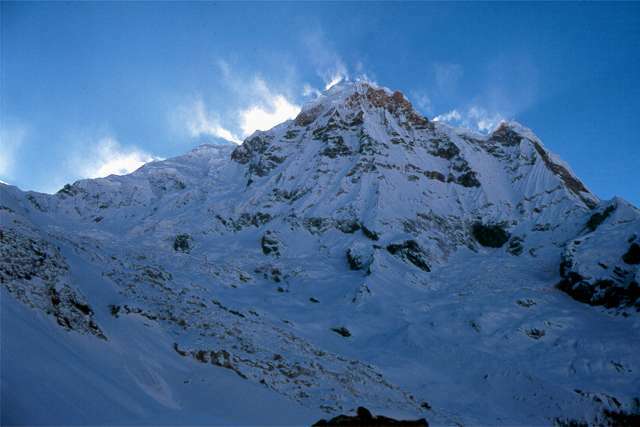 Our first clue to problems ahead was the Annapurna Base Camp tea houses buried under several meters of snow. 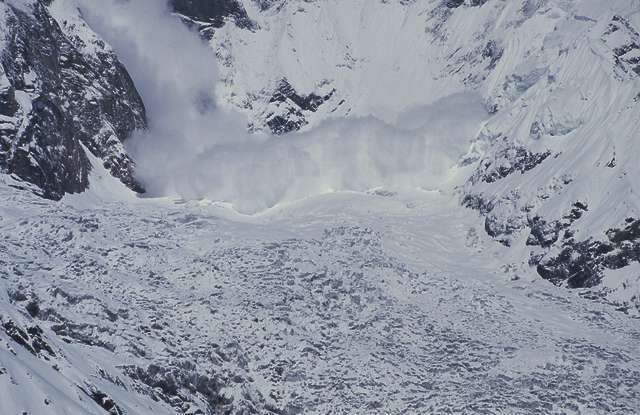 The second was the rather large, frequent avalanches on the peaks around us. We failed to recognize these warning signs and set up our base camp. 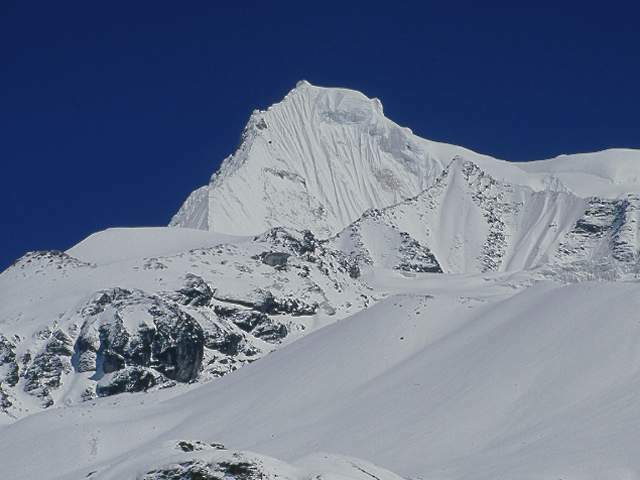 After spending two days in preparation we made a recon up the Annapurna South Glacier and cached a few loads of gear. Visibility was low and the snow condition was horrendous with the top few centimeters concealing a layer of corn snow that was up to a meter deep. One step would be good and we'd sink only ankle deep then three steps later we'd break through to about mid-thigh. Nevertheless, we were hoping things would be better higher so we continued. The following day (when we wanted to cross the glacier and ascend to a high camp) dawned bright and sunny so after breakfast we packed our remaining gear and headed out. Although the trail had been broken on the recon, the bright sun made conditions much worse. Almost every step we'd sink knee deep and then the next we'd be up to our hips struggling to get out. We passed our cache and found a place to ascend the moraine to the shelf about 100 meters above the glacier. It was now early afternoon and the slope had received the full force of the sun's rays for several hours. The last 30 meters resembled swimming as we "floundered" almost waist-deep plunging arms into the snow trying to claw our way up. On top we assessed the situation and determined that this was as far as we could reasonably go in one day. We set up our tents and returned to the cache for our remaining gear. 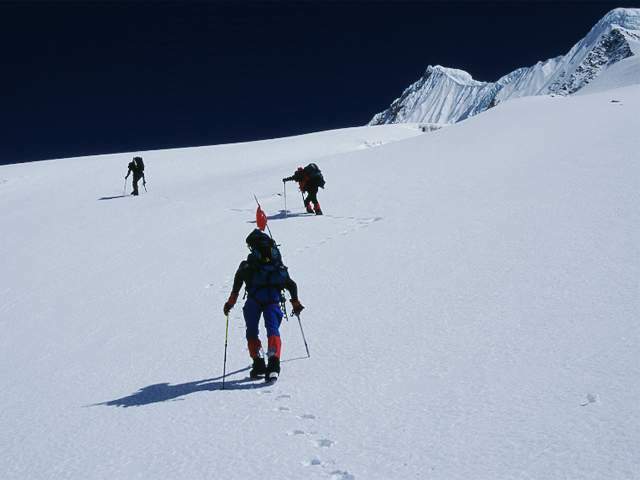 In one day we had only crossed the glacier and were hardly 100 meters higher than base camp. We decided the next day would be spent moving camp to where we could attempt Tharpu Chuli and explore a route up Singu Chuli. This day also began sunny and clear and our attitudes seemed to reflect the beautiful vistas around us but this changed with the toil of carrying loads higher. We found a spot at just over 4900m / 16,000ft and while glissading down for the second load clouds began to close in. Maybe this was a portent of things to come but visibility was still OK with only light snow so we continued and spent our second night anticipating the climb. Despite the previous day's clouds it was clear when we emerged from our tents for the day ahead. The perfect snow conditions this morning were in stark contrast to what we'd experienced thus far as we headed up the 35-45 degree slope above camp. We made good progress for a few hours then the first crevasses revealed themselves. We roped up; Rod and Don together and Todd roped to me. Travel became slower as we zig-zagged around more and more frequent slots. 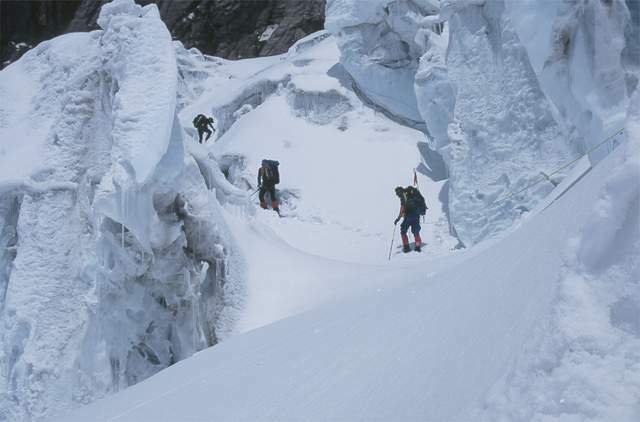 Soon we faced a fairly imposing icefall but it seemed the only course was through it. Even though we abhorred this option we headed in hoping it would be short and quick. It was neither and we were forced to head away from our intended route. When we finally cleared the icefall it was well into the day and we realized that Tharpu Chuli was out of reach. We continued up to a small point on our left to get a better view and figure what to do next. When we topped out to our astonishment all three altimeters agreed at about 5580m / 18,300ft or 100 meters ABOVE Tharpu Chuli! We had gone much farther to the left (northeast) and were somewhere between Rakshi Peak and the South Ridge of Singu Chuli. The weather was still perfect; no wind and a bright sun that made it just warm enough to be comfortable without the horrendous snow conditions we encountered lower. After a short rest we decided to find another way down avoiding the icefall. A quick map study showed a couloir to the west that would do the trick. We headed to it, descended a couple hundred meters and were faced with a major flaw in the maps of the area. The contour interval on the map was 100 meters meaning that some rather large terrain features could go unrecorded. We ran into one of these in the form of a 100 meter wall below us. Cursing loudly we retraced our steps and headed into the dreaded icefall. Near the bottom the snow had softened a bit weakening the snow bridges we had crossed earlier. Although the ones we occasionally broke through were small and not particularly serious, I broke through a hidden one that gave me quite a scare. I dropped in about chest-deep landing upright on a sturdy snow bridge just wide enough to stand on. The gap was more than a meter wide and a glance to either side revealed black nothingness. I scrambled out and away as quickly as possible and didn't look back even when Todd at the other end of the rope went around the same spot. The going was necessarily slow and darkness descended on us an hour before we reached camp. Before crawling into our bags the decision was made to rest the next day. No one expressed it but we knew there would be no more climbing until after our return to base camp. During the night clouds we had seen coming up the valley reached us and it began to snow heavily. We slept late, shoveled snow away from the tents, ate, shoveled more snow away from the tents, then shoveled some more. What really struck me this day was in mid afternoon it was still snowing but so hot in the tent that I stripped to only my underwear bottoms. Later it cooled down a bit so I got out to shovel more snow from the tent and take some photographs. In the morning Todd's stove which he and I had been using flamed out. We had planned five days food and fuel so this was the day we wanted to return to base camp. It was still snowing with visibility only 25-50 meters when we packed to leave. Now's a good time to mention that the slope below camp all the way down to the shelf above the glacier; (600m / 2000ft) had an angle of about 35 - 40 degrees. 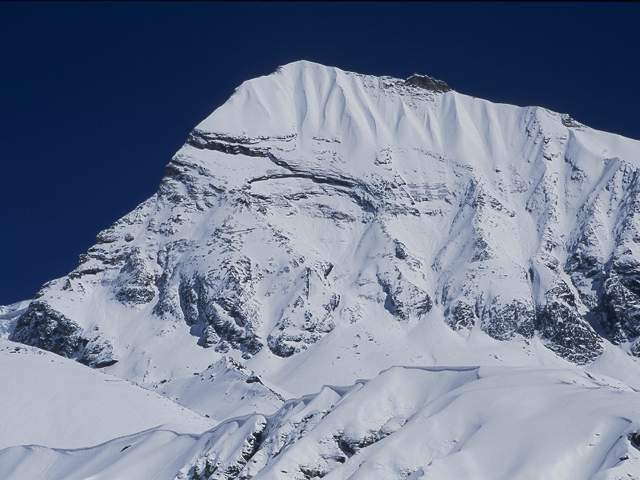 The "textbook" avalanche slope is 38 degrees. As we roped up Rod kept saying things like "I don't like this" and "this is how people get killed" over and over and over. With Don belaying, Rod lead off, quickly disappearing into the clouds. Suddenly the rope went taut and Don dropped to the snow jamming his ax to the hilt to stop Rod. A minute later Rod came back into view shaking his head, muttering something. As he came closer we heard his words: "we're not going anywhere today", "we're not going anywhere today", over and over. Just as he started down the slope he had started a large slab avalanche that probably didn't stop until it hit the glacier. We set the tents back up, (a bit closer this time to share cooking duties) and settled in to wait the conditions out. Sometime in the wee hours of the morning the snow stopped and was replaced briefly by a stiff wind that gusted to about 110 kph / 70 mph or better. When we crawled out that morning we were faced with biting cold and crystal-clear skies. The avalanche danger was extreme (at least two meters of new snow) so we headed out as quickly as possible to take advantage of the frozen surface. Using two ropes and a forty foot length of "super-tape" we tied together in one long line. We started down with Rod in the lead all stepping lightly but as quickly as possible to reach the glacier without disturbing the volatile snow surface. It was quick going and we each had heart-stopping instances where a step caused a fracture line to start in the snow but thankfully nothing let loose. 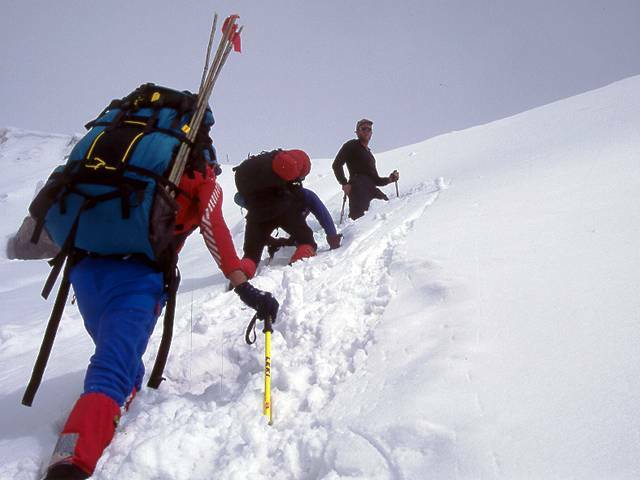 I vividly remember stepping down with my left foot and seeing a slab of snow ten feet in diameter crack loose and slide a few inches then stop. We made it to the shelf above the glacier, let out a sigh of relief from having passed the worst then dropped the last 100m / 300ft down to the glacier. Once finally there (and safe) we stowed the ropes and harnesses, stripped off our excess clothes (it was probably 40 degrees warmer than when we started), and headed across the glacier for home. Back in base camp we decided that the next morning we would discuss how long to wait for conditions to improve. That morning we awoke to overcast skies and light snowfall. In the cook tent the mood was somber as we ate slowly and joked sourly about our situation. When it came time to consider our plans we heard the familiar light sound of snow hitting the tent. 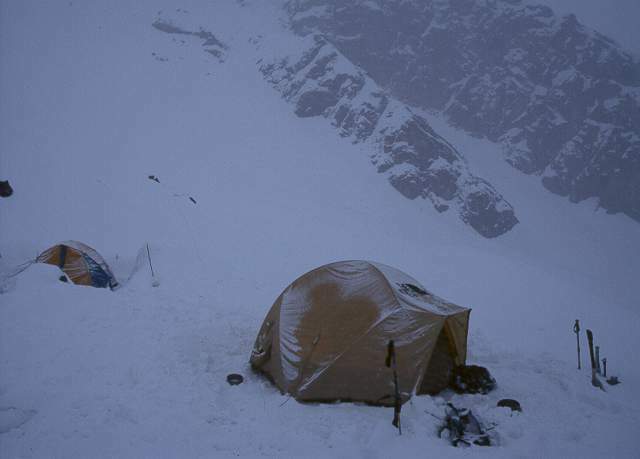 Rod reached over and pulled the tent door open for us all to see - big, heavy flakes were falling. We had determined we would need a week of good weather for the snow to avalanche off or consolidate before being able to attempt anything and now it was snowing again. I remember Rod begin to crumple his map and then just throw it down in disgust; our decision was made. That afternoon we packed our gear and moved into the nearest teahouse - from that point on I was a tourist. When reflecting on our goal, I realize for me it was a lofty one. Personally I cannot help but be satisfied. I encountered (and survived) conditions that would be hard to find back in the US, had reached my personal high altitude, and had added greatly to my fledgling knowledge. Click here for images of the country and trek.